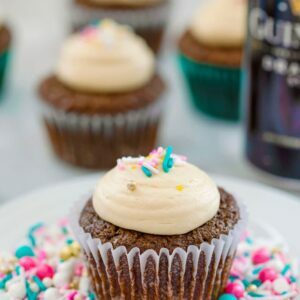 You don't have to be Irish and it doesn't have to be St. Patrick's Day for you to fall in love with these Chocolate Stout Cupcakes with Irish Whiskey Filling and Baileys Frosting! Pre-heat oven to 350 degrees and line a 12-cavity cupcake tin with papers. Bring stout and butter to a simmer in a large, heavy saucepan over medium heat. Add cocoa powder to the saucepan and whisk the mixture until it’s smooth. Remove saucepan from heat. In a separate medium bowl, whisk together the flour, sugar, baking soda, and salt. In the bowl of a stand mixer or in a separate large bowl with a hand mixer (or whisk) beat together egg and sour cream, until combined. Add the chocolate stout mixture to the egg mixture and beat until just combined. Add the dry mixture to the wet mixture and mix until just combined, taking care not to over-mix. Divide batter among cupcake liners, filling them about 3/4 of the way. Bake for about 17-20 minutes, until a toothpick stuck into center of cupcake comes out clean. Let the cupcakes cool in the pan for a few minutes and then take them out to cool completely on a wire rack. Once cupcakes are cooled completely, core out a small section from the middle using either a knife or a cupcake corer. Spoon Irish whiskey filling into centers of cupcakes. Frost cupcakes with Baileys frosting. I used a Wilton 1A pastry tip for mine. In a small saucepan, bring cream just to a boil (keep a close eye on it and remove from heat right when it starts boiling). Pour cream over chocolate in bowl and let sit for 1 minute. Then, stir until chocolate is completely melted and smooth. Add butter, Baileys, and Irish whiskey, and stir to combine. In the bowl of a mixer or in a large bowl with a hand mixer, mix butter on medium speed until it’s nice and fluffy. Add confectioners’ sugar one cup at a time and beat until well-combined. Add the Baileys and beat until combined. If frosting is too thin, add more confectioners' sugar a couple tablespoons at a time. Recipe adapted from Serious Eats and Smitten Kitchen.